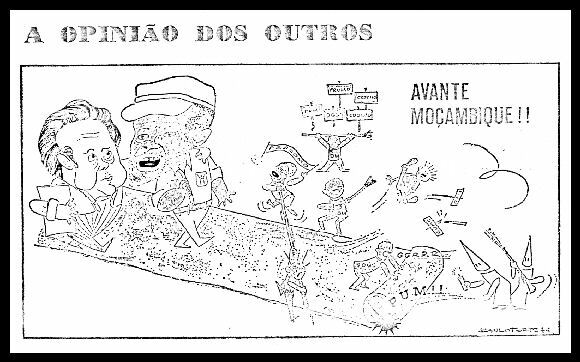 This cartoon, re-published in the Diário de Lisboa on 10 August 1974, was first published in the Lourenço Marques afternoon paper A Tribuna. It refers to possible future negotiations, foreseen by the Democratas de Moçambique, between Samora Machel and Mário Soares; alongside the path are the various minor parties such as FRECOMO, FICO and GUMO, while white rightists, dressed in Ku Klux Klan hoods, try to block the way. The DGS, CODEMO, the PPM and PRUMO maintain their distance. The best-known cartoon figure from post-independence Mozambique is undoubtedly Xiconhoca, "the enemy". The inspired and derogatory nickname was borrowed from a notoriously brutal Mozambican PIDE prison guard, Francisco Langa [aka Francisco or Xico Malhanana, "Francisco the Snake"], who was one of the few PIDE agents in Maputo who had actually been detained by August 1974. A stylised Xiconhoca figure, often dressed in flip-flops and shorts, waving Frelimo flags while still owing allegiance to PIDE and the GE's is shown in colour below. Xiconhoca o Inimigo is pretty much anybody who is lazy, a drunkard, a follower of European fashion, bourgeois, or, in essence, anti-Frelimo. 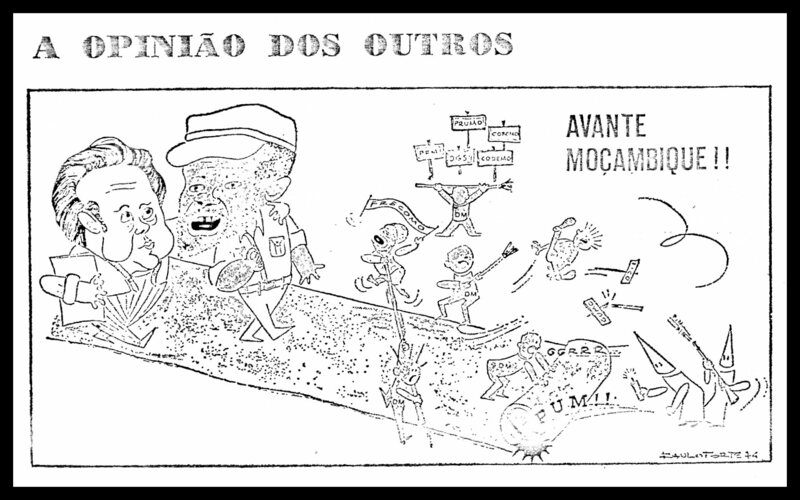 In the cartoon below, which shows him asleep at his workbench surrounded by cigarette butts and an empty bottle, the caption in Portuguese reads: "... he's a saboteur of the national economy, he's got no class consciousness, he's a dead weight in the workshop, to sum up, he's a XICONHOCA!" Click on the image to download a 200 Kb. TIFF file. 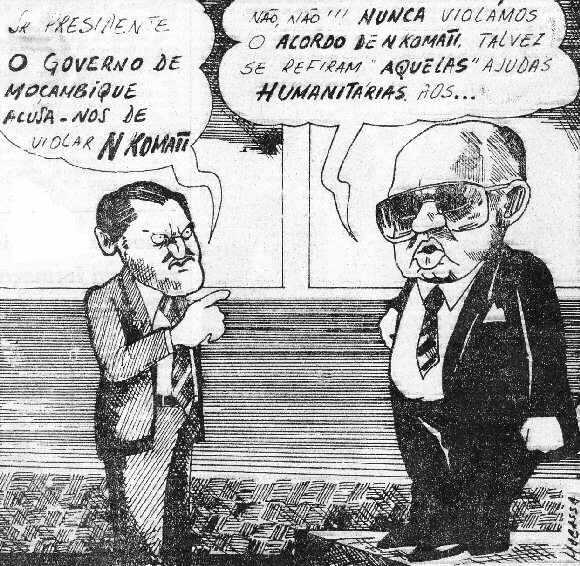 The image below is a political cartoon that was published in the Maputo Sunday newspaper Domingo on 7 August 1983, page 3, within an article with the title 'Operação Produção: o cerco aperta-se' (Operation Production: the circle is closing). Operation Production was a 1983-1984 campaign to move unemployed people (the "unproductive ones" or improdutivos) from the cities to the countryside. It was formally divided into two phases, voluntary and coercive. This cartoon was published at the beginning of the coercive phase, and appears to characterise the unemployed man as by definition dirty, unshaven, with unclipped toenails, and living in filthy conditions. Click on the image to view or download a quality scan of the entire cartoon [3.2 Mb]. 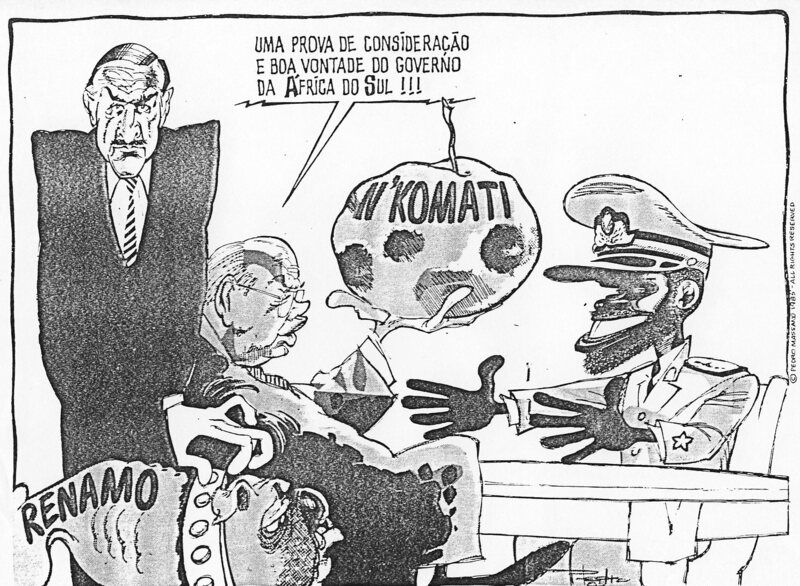 The Nkomati Accord was the subject of cartoons on both the Mozambican and the South African sides. 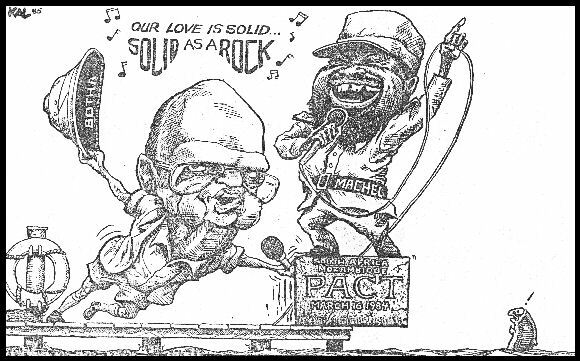 The first cartoon, source unknown, but in Portuguese and certainly contemporary to the event, shows P. W. Botha handing over a rotten apple to a grinning Samora Machel, while a glowering Pik Botha stands in the background, holding the collar of the Renamo bulldog. P. W. Botha is saying, "This is a token of the respect and goodwill of the South African government." 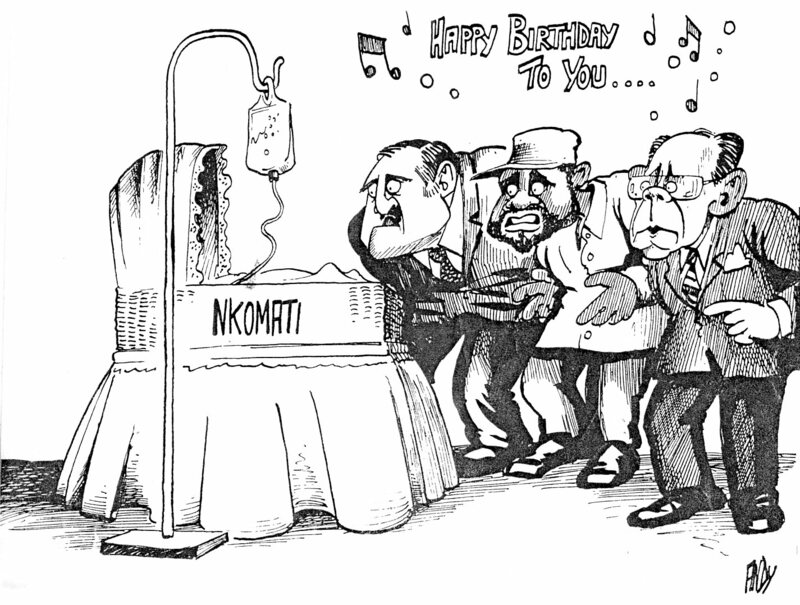 The joke refers to a gift of apples and fruit to the Mozambican people by South Africa just after Nkomati was signed. Click on the image to view or download a quality scan of the entire cartoon [525 Kb]. The two cartoons below were published on the first anniversary of the agreement in March 1985, when its shaky character had already become obvious. The first cartoon, "Our Love is Solid, Solid as a Rock" was published in the Observer in London on 17 March 1985 and needs no further commentary. The second cartoon [source unknown] is also in English, and shows a worried Pik Botha, Samora Machel and Magnus Malan singing happy birthday to an ailing infant – the one-year-old Accord – on a drip feed. 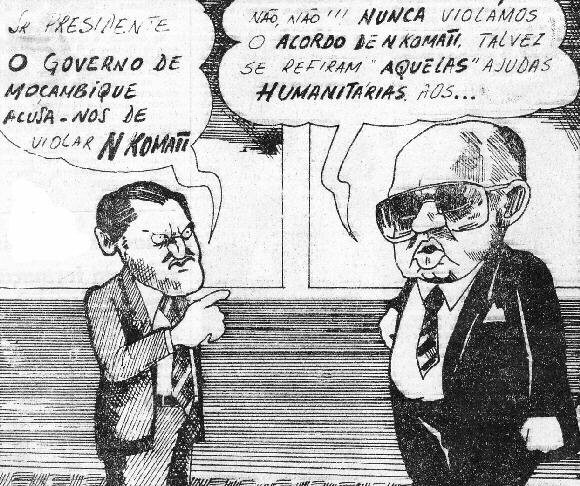 Finally, a cartoon from the Maputo daily paper Notícias, published on 3 October 1985, has Pik Botha saying to P.W. : "Mr. President, the Mozambican government is accusing us of violating Nkomati", to which P. W. responds "No, no, we have never violated the Nkomati accord. Perhaps they are referring to that «humanitarian aid» to ..." with the reference to Renamo left unsaid. This page was last updated on Wednesday 16 June 2010.